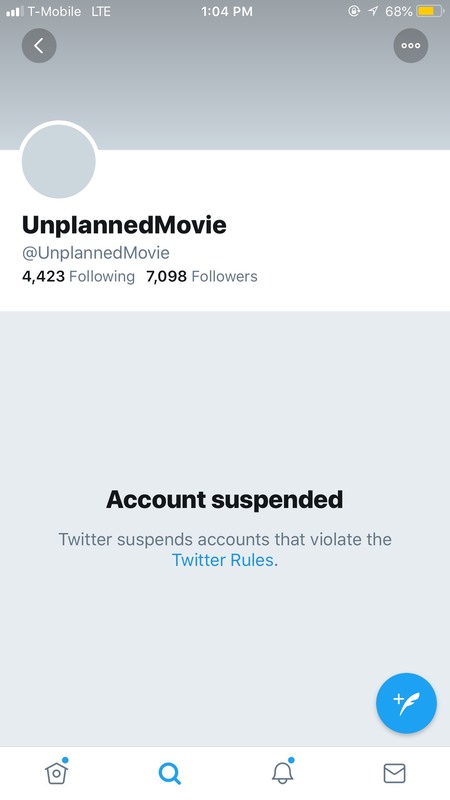 “Unplanned,” a film on a former abortion clinic director who became pro-life, opened in theaters Friday, but Twitter temporarily suspended the movie’s account Saturday, causing pro-lifers to question its reasoning. The Daily Caller News Foundation reached out to the social media platform for comment and learned a different account violated Twitter rules, causing the system to suspend related accounts, according to Twitter. When Twitter took a second look, it decided the “Unplanned” account should not be suspended and reinstated it. Twitter did not specify what other related account had caused this. Live Action founder Lila Rose suggested her group and “Unplanned” face censorship because of their pro-life views. The “Unplanned” account reported Saturday afternoon it gained 10,000 new followers since the temporary suspension.